Stage 1 R-tech TiV™ custom 1.8T rolling road remaps are only £350+vat this includes full health check with diagnostics and pressure/smoke tests. You will also get before and after printed dyno graphs with peak hp numbers and exact delta power gains from the custom mapping session which can take upto 3 hours on the dyno to fully setup and refine. Look in the spare tire well. There is a sticker on the side wall of the well, showing all the spec codes for the car and a 3 letter code in bold text. Or take off the engine cover, (facing the engine) look at the left side closest to you. The engine code is stamped into an engine lift bracket facing up. List of codes you might find AEB AGU AYP ARZ APP AJH AJL APU AQX AWT AWU AUM AUQ BBU BJX BFB BVP AWV BAM AMK BFV APY APX if your code is not listed please call us for the details. These are realistic power outputs for healthy engines some older car setups may make less power some may make more, there is no exact rule of thumb to final numbers, but we know your post remap grin will be HUGE! To get the very best from your R-Tech stage1 TiV™ custom mapping session you will need a healthy running engine running on decent engine oil (5/40 Quantum Platinum recommend ( £26) from main dealers) You will also need a strong air tight diverter valve (DV) as the older standard valves are prone to fail and cause power loss and turbo lag. We recommend the upgrade Forge Motorsport 007p DV with yellow spring (£85) or the latest stock valve from the main dealers just ask for part number 06A145710N (£30). So to sum up for Stage1 the basics are good engine oil, a good DV and good fuel. We will carry out a diagnostics health check prior to tuning your car to stage1, this will also include a smoke test to make sure your engine has no leak which could compromise the performance. Enhancing your engine at Stage 1 mapping with bolt on mods. You can unlock more power from your stage1 tuning by improving flow, the more you do to improve air at stage1 the greater the power you will get across the whole dyno plot post remap. These recommendations are not needed or compulsory but will improve the torque band by no end and can be your first steps to go to stage2 power and above. 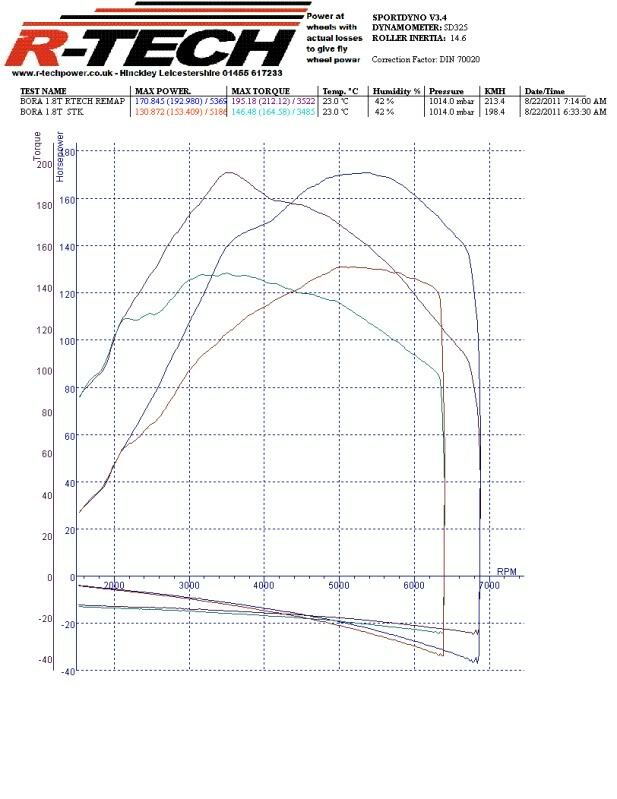 We have found for the K03 K03s engines that a cold air induction kit( CAI) (£120) or Pipercross panel filter (£34) will improve the air flow at the higher rpm and will aid turbo spooling and will give 4-5bhp 5-6lbft more at points on the graph (not on peak power). To aid the flow even more at stage1 you could also install a high flow turbo intake pipe (TIP) £125 The only decent flowing tips on the market are from Forge and SFS, you can find cheap £50 TIPs on eBay but the bodies are much more restrictive than the stock TIP and are very poor cheap investments. 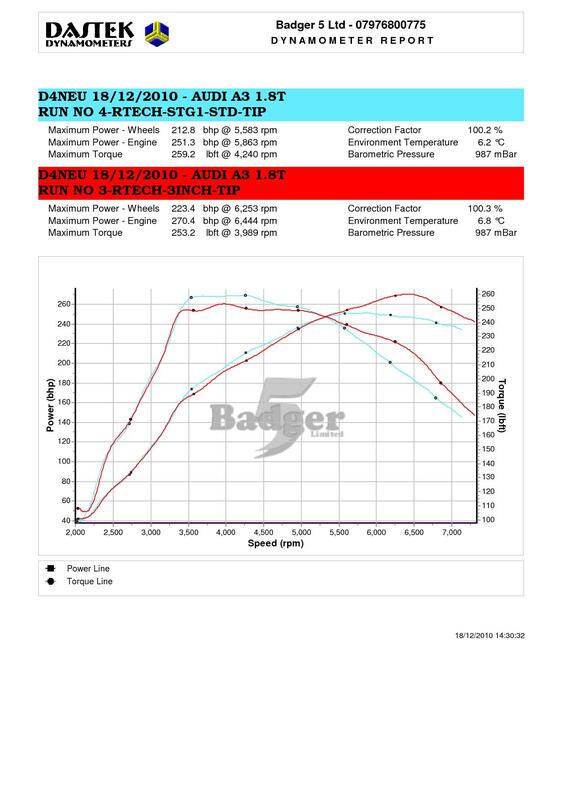 For the K04 turbo engines BAM AMK BFV APY APX, we are seeing huge additional power gains at stage1 just from a decent cold air induction kit (CAI) (£120) linked with an SFS or Badger5 80mm large body turbo intake pipe (TIP) (from £130) Just by running the TIP and CAI with your stage1 map you can see up to 19bhp 20lbft more power at points on the dyno plot post remap. This combination is a must have if your wanting the very best power from your car or if you are planning to go to stage 2 then this is compulsory for willy waving bhp numbers across the whole rpm range. Again any other bolt on mod which improves air flow into the engine and speeds up the exhaust gasses exit can be added to your stage1 setup to improve the power output. You can add parts that improve flow to your car after the stage1 remap and not worry about having to have the car mapped or tweaked again until you have all your hardware mod and ready for stage 2 power. Nice huge delta gains over the stock factory map.